Finance Credit FNC is a new type of credit evaluation model, which evolves from a traditional credit information that depends on financial history. It utilizes categories of online / mobile social network and relation chain information. 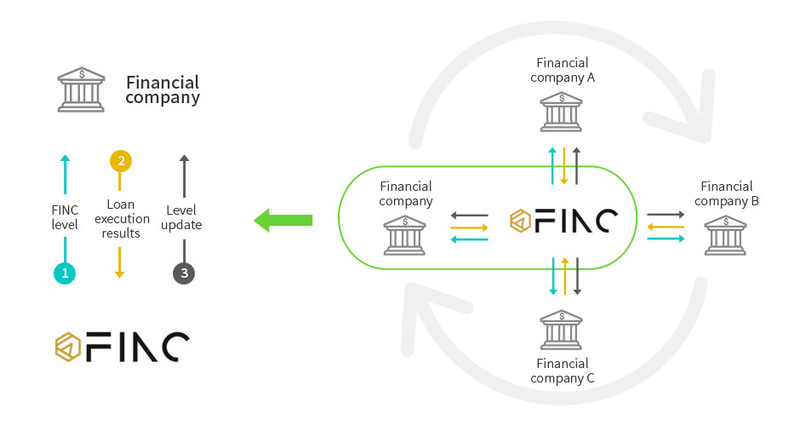 FINC is an abbreviation of Fintech Credit. It acquires various alternative data 100% online basis and performs Positive item based credit evaluation. Then, connecting the loan products according to the ratings grade. FINC identifies and assesses real income / expenditure in real life, via actual owner’s health insurance payments and year-end accounts, rather than the estimated income / expenditure amount. FINC distinguishes between “first step into society” who do not receive reasonable credit evaluation because of insufficient financial data. When you receive a relatively good evaluation within the “first step into society” group, you receive a good credit rating. Unlike the Negative assessment methodology, the FINC focuses on evaluating the importance of the existing credit rating model to uncover potential bona fide clients. FINC assesses the trend of similarity based on the original psychological theory of social networking by acquiring / analyzing the contents of the SNS. · such as average office hours, annual income, and use of debit cards. · In composes interested information, such as insurance payment period, total account holder balance, cell phone payment details, and payment details of the insurance policy. ·But it will increase users’ interest in the service, and as a financial institution. ·Report on loan applicant’s risk transactions / activity details such as loan transfer history, telecommunication fee chargeback history, etc. to financial institutions. The results of the loan execution and loan data received from the Affiliate finance companies are concentrated in FINC, and can be leveraged in ﬁltering and under-value transactions to be leveraged for CSS(Credit Scoring System) updated and poor risk. After confirming your FINC rating, the borrower will select the loan item that meets your grade and apply for a loan. The data and evaluation reports of the borrower are transferred to the financial institution and utilized for loan review.